Taking past MLB card releases from Topps, and adding an on-card signature, 2018 Topps Archives Signature Series Active Player Edition Baseball delivers one autograph per box. Like a pull on a slot machine, 2018 Topps Archives Signature Series Active Player Edition Baseball is a one-off chance at some of the biggest current names in the sport. Every box contains a previously-issued option that is upgraded with a hard-signed autograph, foil-stamped logo, and finite print run. Each serial numbered card also comes in an individual case. In many instances, 2018 Topps Archives Signature Series Active Player Edition Baseball adds an autograph to an earlier base card or insert. However, there are also relic cards included in the program. This format is virtually identical to the 2017 Active Edition, and there was also a separate Postseason Edition in 2017. View current 2018 Topps Archives Signature Series autographs on eBay. Many players have multiple versions with varying print runs. Topps kinda forgot to include players from all teams so they are excluding fans of teams for autograph cards. I do not see any players from my team so I will not be buying. I purchased 1 box on release day and got a die cut 1/1 Mike Trout auto! Great looking card and the signature is perfect! 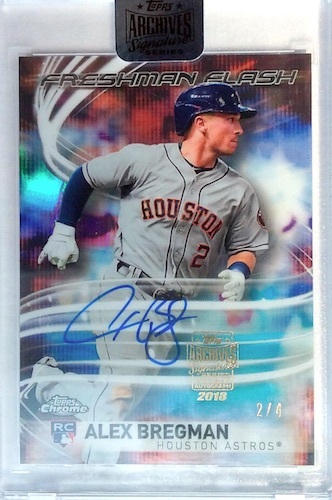 he is a really nice guy and signs for so many people…..
and I see the same Topps card online marked with a 1/1 number.. going for $1200 on ebay..
how much would mine be worth…? @BoogieDown, I would imagine Topps would tell you their stuff is verified and is 100% legit. That is what you are paying for; the absolute guarantee. Plus, if it is numbered, it is a limited number of that specific card supplied by Topps. You could have Trout sign as many cards as you could get a hold of and no one would know how many times he signed that type of card. By numbering their cards, Topps makes that specific product more valuable. If you dont mind the gamble it can have its rewards. I’ve bought around 10 boxes. It comes down to wether you have disposable income to toss around. Steve Matz /99, Didi with Arizona, Kimbrel, the reds closer, nothing exciting, then I got a Mitch Haniger bowman chrome rookie auto 1/1. Not bad, especially if he can put the team on his back again. Annnnnnd Aaron Judge buyback redemption. Idk what it is, but a few people have the redemption card unscratched on Ebay for 1000. That made me smile. Pay $35.00 for a box and get a $8.00 pull. Not worth it.